Karnataka is one state in southern India. 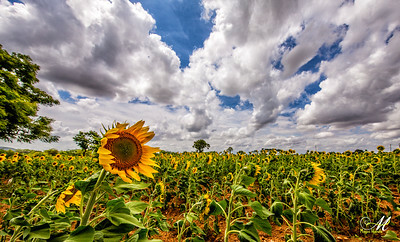 The photo captured from Gundalpet-Karnataka, India. 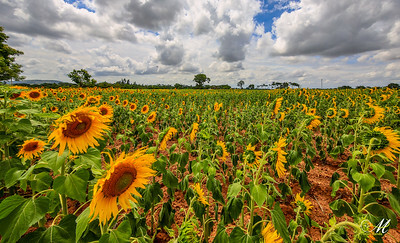 the place known as land of flowers. 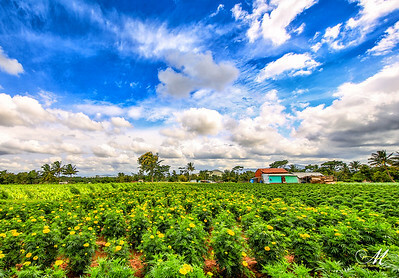 The eye catcher is a Marigold (chendumalli) farm grown feeling like green carpet with a colorful beautiful farm hut.. 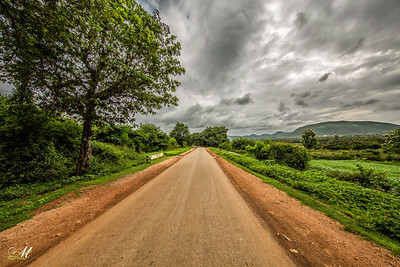 The photo captured from Gundalpet-Karnataka, India. the place known as land of flowers. 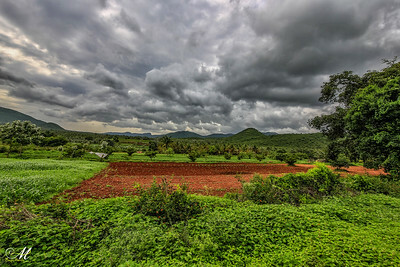 The photo captured from Gundalpet-Karnataka, India. the place known as land of flowers. 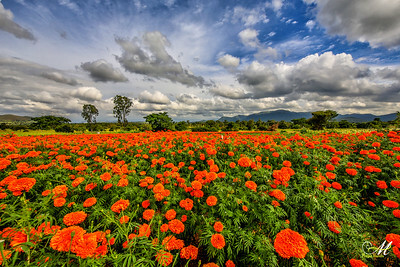 The eye catcher is a Orange Marigold (chendumalli) farm grown feeling like an orange carpet under the beautiful puffy clouds..
Agumbe is a small village located in Shimoga district, Thirthahalli taluk in the Malnad region of Karnataka, India. It is sometimes called "The Cherrapunji of the South" after Cherrapunji, in Northeast India. Agumbe is associated with rain forest conservation efforts, documentation of medicinal plants, tourism (trekking and photography), and promotion of cottage industry. altitude 643 m from sea level. 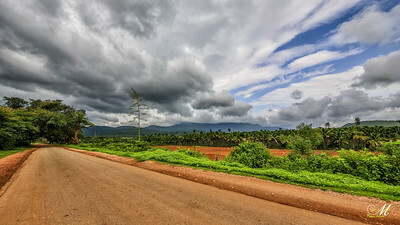 Chikkamagaluru is a district in the state of Karnataka. 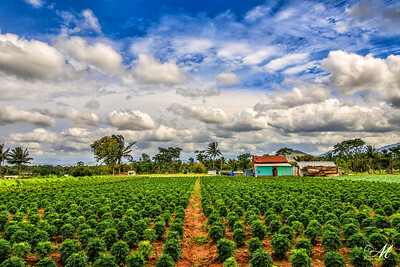 Coffee was first cultivated in India in Chikkamagalur. The mountains in Chikkamagaluru which are a part of the Western Ghats are the source of rivers like Tunga and Bhadra. Mullayanagiri, which is the highest peak in Karnataka is located in the district. 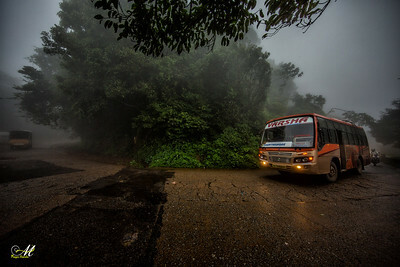 It is also a tourist's paradise containing hill stations like Kemmanagundi and Kudremukh and waterfalls like Manikyadhara, Hebbe, Kallathigiri. Chikkamagaluru district has a rich history as is seen in the Hoysala temple at Amrithapura. Wildlife enthusiasts would be interested in the Kudremukh National Park and Bhadra Wildlife Sanctuary present in this district. 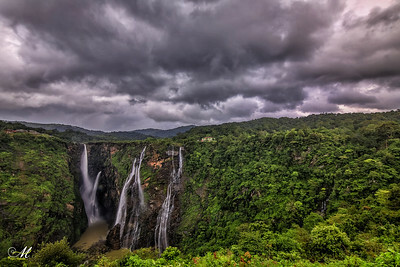 Jog Falls. it is the 2nd highest waterfall in India located near Sagara taluk, Shimoga district in the state of Karnataka. It is a segmented waterfall which, depending on rain and season, becomes a plunge waterfall. The falls are a major tourist attraction and is ranked 13th in the world by the waterfall database. They are also known as the Gersoppa Falls or Jogada Gundi. 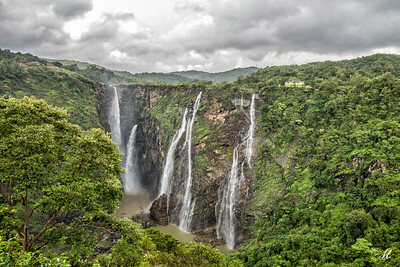 The falls are located on the Uttara Kannada and Sagara border. 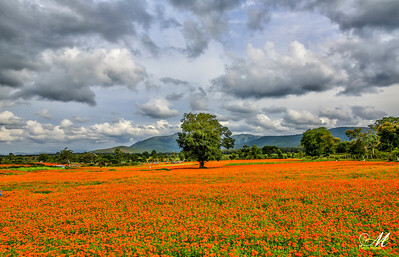 The eye catcher is a Marigold (chendumalli) farm grown feeling like green carpet with a colorful beautiful farm hut..